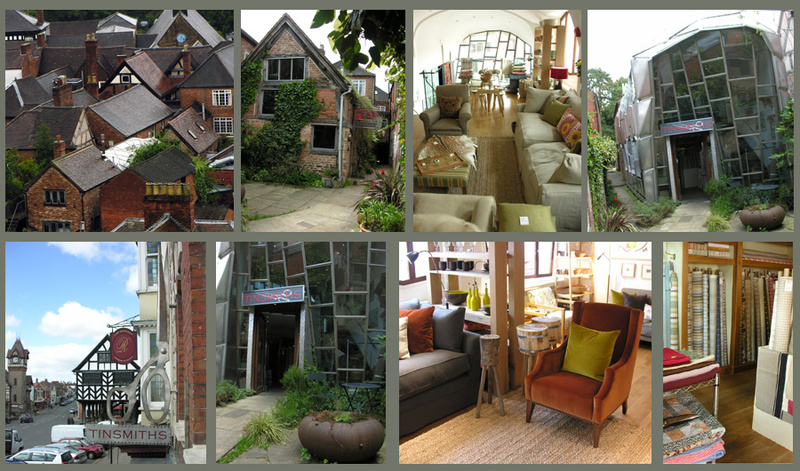 Welcome to Tinsmiths, Ledbury specialist suppliers of natural woven fabrics, lighting, furniture, curtains, blinds and accessories for homes. Ledbury is a small market town in Herefordshire (West of England) with a particular town plan dating back to medieval times which is based on long thin burgage plots. The idea being that your shop was on the “high street” with your workshop behind, living above and garden (complete with pig sty) at the very back of the plot. Tinsmiths has just such a plot. The original timber-framed Tinsmiths workshop – a place to bring a saucepan for a new handle, an umbrella for a new spoke or a carriage light for a new lens – was sensitively renovated by Alex Clive and opened as the first Tinsmiths in 1994. Two years later, the new Tinsmiths showroom opened. Designed and built by Alex Clive, the building is a most unexpected sight as you emerge from the shade of the alleyway approach. The stainless steel and glass building is light and airy – designed to offset its north-facing aspect – and a hand-crafted construction. To find out more about it, view “The Miracle of Ledbury” by Jonathan Glancy. Tinsmiths expertise is in fabric and lighting. Rolls of natural Linens, striped and checked fabrics, traditional tickings, woollen cloth, oilcloths and printed fabrics fill the ground floor of the new building. Light fittings are shown on the first floor of the original building and any further available space is filled with furniture (often upholstered in Tinsmiths’ fabric), fine art prints, blankets, rugs, glass and ceramics. Tinsmiths handsew made to measure curtains and blinds on the premises and often send these by courier to customers all over the country. More detailed information “About Tinsmiths” can be found on our main website.